Beauty Reigns: A Baroque Sensibility in Recent Painting brings together thirteen abstract painters whose beautiful, fascinating, and sometimes, strange work is a refreshing departure from the minimalist tendencies often found in contemporary art. According to the press release, with this exhibition, curator Rene Paul Barilleaux, wanted to highlight the "exoticism, exuberance, and optimism" in the work of the artists he selected. Additionally, these artists work in a style that is "characterized in whole or part by high-key color, obsessive layering of surface imagery, use of overall and repeated patterns, stylized motifs, fragments of representation, and a tension between melancholy and the sublime." View of Susan Chrysler White's Medusa (foreground) and Rosalyn Schwartz's paintings at the McNay Art Museum. Photo By Stephanie Torres. Susan Chrysler White's floor-to-ceiling plexiglass chandelier, Medusa, is a dramatic and elegant inclusion in this exhibition. Much like its mythic namesake, this Baroque-inspired sculpture commands the viewer's attention compelling them to look its way. View of Kamrooz Aram's work at the McNay Art Museum. Photo By Stephanie Torres. Kamrooz Aram explores the beauty of floral motifs found on Persian carpets and pushes those traditional elements towards further abstraction. Aram creates these paintings through a repetitive process of building up the surface pattern, destroying it, and then building it up again. The end result is a dynamic, fragmented image that defies the viewer's perception of what decoration is meant to be. 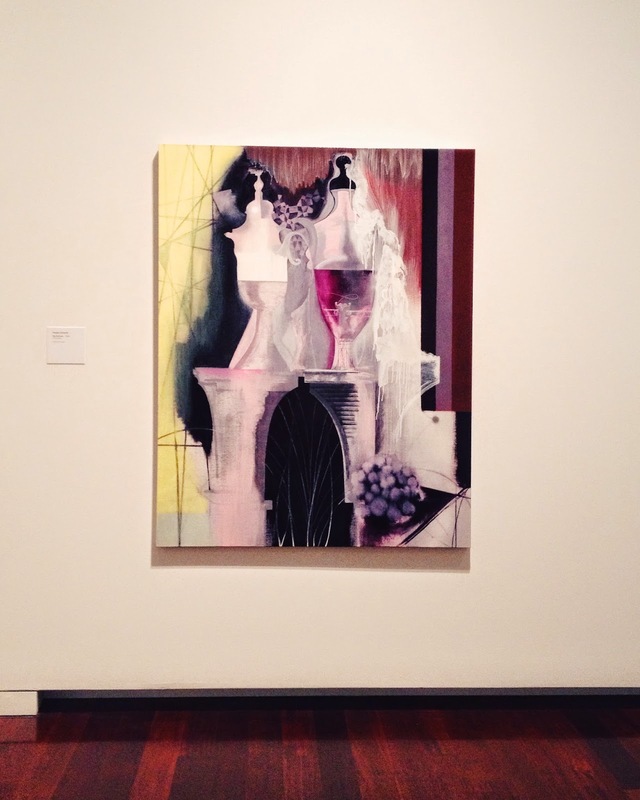 View of Rosalyn Schwartz's The Big Perfume at the McNay Art Museum. Photo By Stephanie Torres. Rosalyn Schwartz explores the lush extravagance of interior design and draws upon Classical and Cubist elements in her abstracted still life, The Big Perfume. In it, two large liquid-filled urns sit atop a pair of pedestals and a bunch of loosely painted grapes appears in the flattened foreground. With this painting, Schwartz creates a subtle meditation on excess and the allure of decorative objects. The wide range of artists featured in this exhibition exemplify Baroque aesthetic tendencies, engaging the viewer not only with the beauty of their work, but also with the drama and excess that invariably elicits an emotional response from the viewer. Beauty Reigns: A Baroque Sensibility in Recent Painting is on view at the McNay Art Museum until August 17th.